In anticipation of receiving the 8th Max Perutz Prize of the European Crystallographic Association, Professor John R. Helliwell, Emeritus Professor of Chemistry at the University of Manchester and recent ACA Patterson Award winner, shares some reflections on his career and achievements, and the importance of crystallography. John, could you start by giving us a brief history of your career to date? I have worked in the scientific civil service (at Daresbury Laboratory) and in academia, where I served on the faculty in two physics departments (Keele and York Universities) and one chemistry department (Manchester University). My research career started in the Oxford University Department of Zoology and led to a DPhil in molecular biophysics. I also have a Doctorate of Science in Physics (from the University of York), and these last 26 years I have been a Professor of Structural Chemistry, now Emeritus. My research and teaching have involved students and postdocs from many countries of the World; so, as a researcher and educator, one gets a very wide vision of the nations and peoples of the World. Overall I would describe myself as a trained crystallographer and an interdisciplinary scientist and educator. I have published research results from biological crystallography, chemical crystallography, physical crystallography and on instrumentation and experimental techniques. I have taught a wide variety of undergraduate courses and supervised postgraduate students trained in chemistry, physics and biological sciences. How did you get into the field of crystallography? I first got interested when I was an undergraduate. I did physics at York University and I took optional courses in X-ray crystallography and biophysics. These were given by really leading researchers and educators, Professor Michael Woolfson FRS, who taught the X-ray crystallography, and Dr Peter Main (Honorary Member of the British Crystallographic Association) who taught the biophysics. So, it went from there really. That was the genesis. I went on to do a DPhil in protein crystallography in Oxford with Dr Margaret Adams. I might have become an astrophysicist – I was keen on that as well – but I always enjoyed chemistry at school, so it was perhaps quite natural that I moved towards a mixture of physical and chemical sciences in my research. At York, I also found that I enjoyed computing. That works very nicely for a crystallographer doing crystal structure analysis and I was good at maths at school; so that was overall a good mixture for becoming a modern-day crystallographer, I think. Were there any major milestones along the way and key turning points? The major aspects may be best measured by when one makes major changes in one’s career. The phases I can identify, punctuated by milestone changes, involved first approximately four decades involved with synchrotron radiation instrumentation and methods development, including the very important services to industry. This was based at the UK’s Daresbury SRS, but also supporting the European Synchrotron Radiation Facility initiative in numerous ways (first at CERN in Geneva, where the European Synchrotron Radiation Project was based, and then in Grenoble). I also served in various SR Facility Advisory Committee roles around the World. The second phase covered my researches in physical, biological and chemical crystallography and various molecular structural studies research programmes. Third, I have taken on some of the biggest tasks one can in the service of the crystallographic community. The fourth phase would cover my crystallographic researches with neutrons at the Institut Laue Langevin these last two decades, and, most recently, assisting the European Spallation Neutron Source in Lund. Finally, I take pride in my students and what they have achieved and the major challenges they have taken up. What have been some of your own memorable and personal achievements to date? 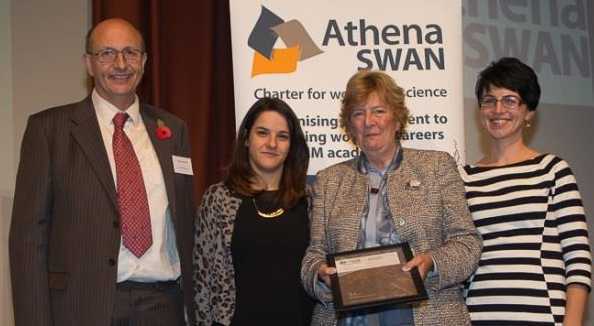 John Helliwell receiving the Athena SWAN School of Chemistry Silver Award on behalf of the School; left to right JRH, Dr Cinzia Casirhagi, Dame Julia Higgins (Patron of Athena SWAN) and Dr Anna Valota (Chair of the School's Post Doc Forum). I have touched upon aspects of these earlier, and they are elaborated in my 8th Max Perutz Award acceptance lecture at the ECM29 Opening Ceremony in Rovinj, Croatia. I would also like to add something about trying to move gender equality in science forward. My DPhil supervisor was female (Dr Margaret Adams), as was her DPhil supervisor (Prof Dorothy Hodgkin OM FRS). With such a pedigree it was not immediately apparent to me that gender equality was a serious issue. When this did become clear, I very actively tried to do something about it. I became gender equality champion in my School of Chemistry in Manchester University, where I led a working group on behalf of the School towards first a Bronze and then a Silver Award of achievement from the UK’s Department of Business, Innovation and Science ‘Athena SWAN’ scheme (SWAN = Science Women’s Academic Network). The major issue is of course the widespread inequality that women experience in making their way in science. Perhaps less highlighted is that the natural talent that we train to a very high standard as graduates in chemistry (40% women) and physics (20%) and so on leads to around only 5% of professors being women. This is a massive discrepancy. We have to understand each stage of the academic career progression path, and do much better at assisting women at each hurdle. Otherwise we will continue to see this huge loss of trained talent. That is what the Athena SWAN scheme is about, a marvellous initiative of our UK Government, and I am glad to have played a role in trying to help. Crystallography as a field has a better than average performance – for instance we have seen three female IUCr Presidents. That is good, but much remains to be done. Can we round off this interview with why you feel crystallography is so important? People in general have a curiosity about crystals. I have taken the time and trouble to meet the public and schoolchildren in many ways: at our University School Open Days; explaining to the media our research results; giving open lectures to workers' associations and the University of the Third Age; and in schools themselves giving 'general science interest' lectures. I have even had the pleasure of delivering a Royal Institution Friday Evening Discourse, Baroness Greenfield presiding, on the topic 'Why does a lobster change colour on cooking?' I find explaining crystallography a joy. I like to start by showing people the double image effect in calcite and asking ‘how do you think that happens?' Besides natural curiosity, at the other end of the spectrum lies the utility of our discoveries as a field. The discovery of new pharmaceuticals for disease treatments is very much assisted these days by structure-based drug design, which has crystallography at its core. And then, of course, the computer is based on perfect single-crystal silicon, of which one deliberately alters the electronic properties by doping to create n- and p-type semiconductors. Probably the most famous scientific discovery of the last century was the structure of DNA, which was based on helical X-ray diffraction data from fibres of DNA – a fantastic piece of basic science laying down the basis for understanding heredity. That discovery has proved so important in modern-day genetics and in DNA fingerprinting in forensic science. I think all of these things appeal to people, right the way from natural curiosity through to the utility of science. These sorts of examples led to formal approval by the United Nations of the International Year of Crystallography 2014, which was brought about following the efforts to make the proposal in the first place of the International Union of Crystallography, under its then President Professor Sine Larsen, and the Moroccan Crystallographic Association, led by Professor Abdelmalek Thalal. This has been a marvellous event for our field and for communicating about our science. Many marvellous things have happened through the IYCr. One I especially liked was Crystallography365 ('tweeting a crystal structure a day’), led by Dr Helen Maynard-Casely and colleagues, which now features as a perpetual calendar on the IYCr legacy website. I think all readers of this piece would agree that science is necessary. We should not be complacent, however; we need to take note of Max Perutz’s book entitled 'Is Science Necessary?' We have to take time and care to explain our work. However to guard against our becoming too utilitarian, I think that Max captures the heart of a scientist in his chapter 'How to become a scientist': 'Without delight and wonder at the works of Nature you might as well join Scotland Yard instead'.